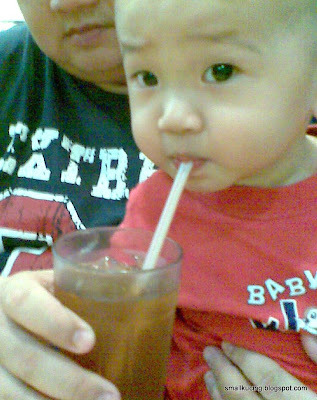 Mamarazzi really tak puas after eating Prawn Mee at The Wok. That's why we end up at Amcorp Mall. At Level 3 of Amcorp Mall there is a small shop called Uncle Snacks Corner situated next to Book Xcess. 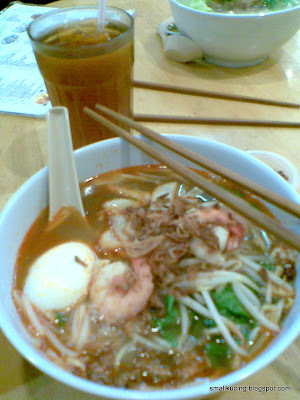 Mamarazzi likes the Prawn Noodle here. For it's Lunch Set, Prawn Noodle with a Glass of Red Dates Water cost less than RM7. And the Prawns are bigger and nicer too. The bowl of noodle have more "liu" if compared to the one at The Wok. More satisfying too. Hmm...nice nice Red Dates Water. Uncle Snacks Corner doesn't only offer Prawn Noodle. They have other thongs like Cantonese Fried Noodle, Hokkien Mee, Fried Rice and etc. However, the Beef Noodle is not nice.